This article is about the protected area in South Australia. For the associated locality, see Lake Gilles, South Australia. Lake Gilles Conservation Park (formerly Lake Gilles National Park) is a protected area in the Australian state of South Australia located in the north of the Eyre Peninsula about 20 kilometres (12 mi) east of Kimba in the gazetted locality of Lake Gilles. The conservation park was originally proclaimed as the Lake Gilles National Park under the former National Parks Act 1966 on 30 September 1971. It was subsequently renamed as the Lake Gilles Conservation Park upon the proclamation of the National Parks and Wildlife Act 1972 on 27 April 1972. On 5 August 2010, the Lake Gilles Conservation Reserve which have been dedicated as a conservation reserve on 9 December 1994 under the state's Crown Lands Act 1929 was added to the conservation park along with another parcel of crown land. As of 2014, access permitted under the state's Mining Act 1971 and Petroleum and Geothermal Energy Act 2000 only applies to the extent of the Lake Gilles water body. ...an ephemeral lake system fringed by samphire communities. The park (sic) provides habitat for the Malleefowl, Slender-billed thornbill, Thick-billed grasswren and migratory waders. Extensive but patchy mallee communities on the eastern plains of the park (sic) include Western Myall and associated chenopod shrubland. The conservation park is classified as an IUCN Category Ia protected area. In 1980, it was listed on the now-defunct Register of the National Estate. In 2012 and 2013, off-trail driving, burning and cutting of native vegetation, and the abandonment of rubbish and furniture were reported to have occurred in the conservation park. ^ a b "Search result for "Lake Gilles Conservation Park " (SA0038288) with the following layers selected – "Suburbs and Localities" and " Place names (gazetteer)"". Property Location Browser. Government of South Australia. Retrieved 19 June 2016. ^ a b c d "Eastern Eyre Peninsula Parks Management Plan" (PDF). Department of Environment, Water and Natural Resources. 2014. pp. 3–4. Retrieved 1 September 2015. ^ a b c "Protected Areas Information System – reserve list (as of 16 July 2015)" (PDF). Department of Environment Water and Natural Resources. Retrieved 3 August 2015. ^ "NATIONAL PARKS ACT, 1966: HUNDRED OF O'CONNOR AND NORTH OUT OF HUNDREDS —LAKE GILLES NATIONAL PARK" (PDF). The South Australian Government Gazette. Government of South Australia: 1227. 11 November 1993. Retrieved 2 January 2017. ^ "National Parks and Wildlife Act, 1972" (PDF). Government of South Australia. 27 April 1972: 702. Retrieved 2 January 2017. ^ "Search result(s) for Lake Gilles Conservation Reserve (Record No. SA0037257) with the following layers being selected – "Suburbs and Localities" and "Parcel labels"". Property Location Browser. Government of South Australia. Retrieved 2 January 2017. ^ "Lake Gilles Conservation Park, Eyre Highway, Kimba (sic), SA, Australia – listing on the now-defunct Register of the National Estate (Place ID 6043)". Australian Heritage Database. Department of the Environment. 21 October 1980. Retrieved 11 March 2019. ^ Barnes, Olivia (18 July 2013). "Trail of destruction at Lake Gilles". Eyre Peninsula Tribune. Retrieved 9 August 2017. 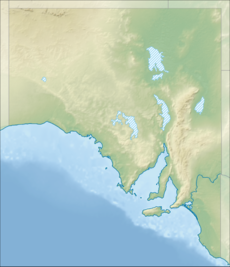 Wikimedia Commons has media related to Lake Gilles, South Australia.